An alert reader has passed on to Life in the Boomer Lane the results of a research study about the benefits of non-conformity. Let’s face it. The human tendancy toward conformity has served us throughout the millenia. Without our need to belong to a group and to obey common rules and mores, we’d all be bouncing off the walls, constantly J-walking, going to work in our pajamas and never brushing our teeth. And, in a horrific, worst-case fantasy scenario, there might also be a chance that a non-conformist, duly-elected President would shun the truth, insult our allies, utter a never-ending stream of preposterous nonsense through Twitter, and wear his ties long enough to highlight the exact location of his genetalia. This extreme example aside, we do conform. We generally cross at the light, obey speed limits, pay our taxes, and tell young moms that their babies are beautiful. But, the elcton of a rogue, clownlike President, is there any advantage to flaunting the norms, marching to the beat of our own drummer, or dancing like no one is watching? In one specific instance, the answer is yes. A study published in the Journal of Consumer Research investigated the theory that people who are nonconformists can potentially be viewed as being more high status and more competent than those who conform to social norms. Case in point: socks. “Socks?” you may very well ask. Who cares about socks. Nobody sees them anyway. Socks are boring, unless they develop a hole at the big toe, and, in that case can make us even more deranged than being audited. Otherwise, who even thinks about socks? The answer is otherwise. The study found that people who have shown to deliberately choose to wear whacky socks, are seen as having increased status and competency in the eyes of others. In other words, people have the potential to see you as more brilliant, creative and successful. “We proposed that, under certain conditions, nonconforming behaviours can be more beneficial to someone than simply trying to fit in. In other words, when it looks deliberate, a person can appear to have a higher status and sense of competency,” stated authors of the study, Silvia Bellezza, Francesca Gino and Anat Keinan from Harvard University. Let us repeat this: People who have shown to deliberately choose to wear whacky socks, are seen as having increased status and competency in the eyes of others. In other words, people have the potential to see you as more brilliant, creative and successful. LBL is, herself, a devotee of crazy socks. If she weren’t, she would never have written this stupid post. But now, she can acknowledge that she is viewed, as she does view herself, as a brilliant, creative, successful sort. She has, over the years, entertained any number of medical personal in pre-op rooms, with her choice of wacky foot attire. She has given birth to children while wearing her socks, and she has, in later years, delighted the offspring of those children with her socks. She currently sports a variety of cat socks that she purchases from China for anywhere from $.99 to $1.15 per pair. She is convinced they are made of nuclear waste, but they are cute, so she purchases them. She also has to cut a notch at the top of each sock, in order to prevent a stoppage of her blood circulation. All worth it for the joy they provide to herself and others. Even more, “It’s this perception that helps us to subtly achieve more success without lack of bravery or confidence.” And that one sentence is enough for LBL to justify wearing toxic fabric that cuts off her curculation. Without containing an ounce of either bravery or confidence, LBL can leap tall building at a single bound or assist anyone stuck under a tractor. She has never actually been called upon to do either, and she strongly hopes she never will. But it’s nice to know that, in a pinch, her cat socks or her polka dot socks or her striped socks or any other of her assorted rule-breaking socks, will have others think that she can. 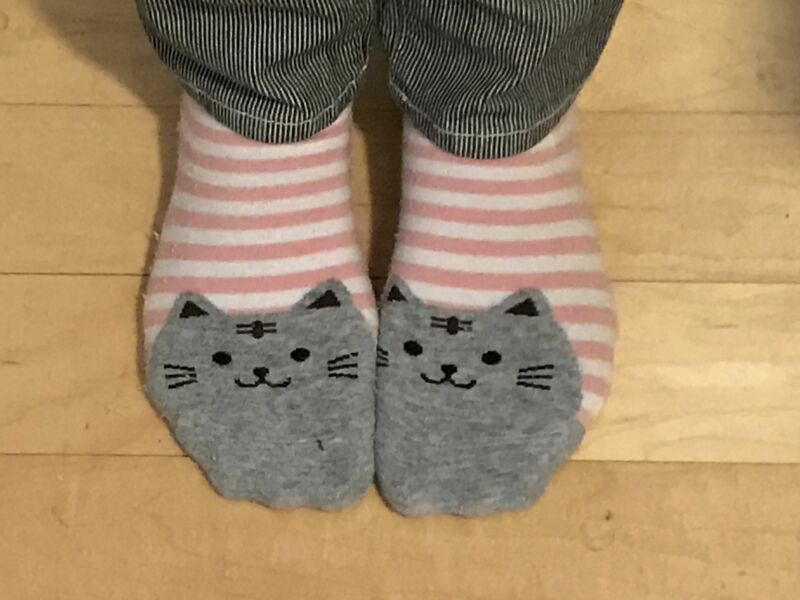 sigh, okay, I’ll go buy wacky socks even though I really like my nice normal socks, but if it increases my status in the world, I can do cat socks. I think. China sells really cheap socks. And send photos. Your status may not improve, but it will give me material for another post. And, in the status of world comfort and amusement for others, you have elevated yourself. All joking aside, thank you for another of your classic laugh-out-loud-while-learning-something-interesting posts! Thanks for sharing the bowling story, Heide. And you are welcome.. I will do anything to amuse. Maybe I’ll write about my underwear next. HA HA AHHAHAAA! Oh my yes … please do write about your underwear! I did a post once about bra-shopping and it remains among my favorite things I’ve ever written. I love crazy socks! When I had my home daycare, the kids couldn’t wait to see what silly socks I had on each day. Amusing kids with socks is the best. I send my grandchildren cheap crazy socks for all the holidays. My three-year-old granddaughter especially loves them. I just bought my son 3 pairs of silly socks for his birthday. I notice he wears others from time to time so I thought this would be good. Our Prime Minister Trudeau wears silly socks in case you have seen them. Makes him stand out even more. Could you see Trump in something like that LOL! Silly sox are great in this suddenly terribly serious world. Socks here i thought I was alone as the nutty RN with so many crazy socks Whew I feel better lol. TY for the inspirations. You’re welcome. And welcome to our illustrious club. Renee, I do adore your socks (and your competence to boot). I was thinking of the Rush song “Subdivisions” whose chorus shows how “conformity” exists even in places like high schools. Love the song, Keith. Politically-speaking, this country now confuses non-conformity with incompetance. As POTUS says, sad.